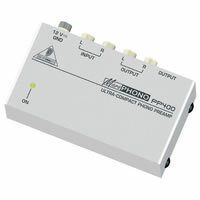 Behringer Phono Pre-Amp PP400, you can lift tunes from vinyl, and then send them to a mixer or a recording unit. This awesome tool converts your phono signal to a line level signal. It's ultra compact in size but big in features. State of the art phono pre-amp to accommodate magnetic pickups, Ultra low noise audio operational amplifiers offer outstanding sound performance.